An iPhone cover in 4 ply merino, knitted in the round, in a textured stitch. If, like me, you’ve just fallen in love with your new smartphone, you’ll want to protect it. What better way than a waffle-stitch cosy? 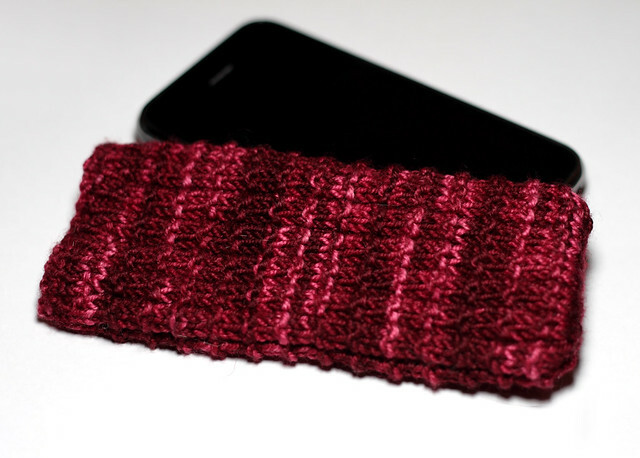 Your phone deserves the best, so choose something with a lot of bounce to show-off the stitch pattern. Some left over, hand-painted, superwash merino sock yarn is ideal. Instructions are given for double pointed needles, but it easily be knit on circular needles using the magic loop technique. The bottom of the cost is joined using the three-needle cast-off (that’s ‘bind-off’ to US English speakers). This technique is a bit fiddly but easy to master, a sewn seam could alternatively be used. The finished cosy measures 13.5 x 6 cm (5 1/4 x 2 1/4 in.) 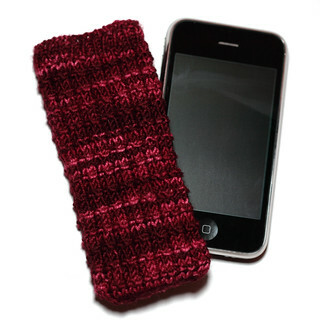 unstretched, and stretches to fit an iPhone 4 or other device measuring approx. 11.5 x 6 x 1 cm (4 1/2 x 2 1/5 x 1/2 in.). If using circular needles, you will need a spare 2.75 mm needle for the three-needle cast-off. Distribute sts across three needles. Join to work in the round, taking care not to twist work. So Cute! Thanks so much. This is just what I was looking for for my new phone! Can’t wait to get started. This is so easy and looks so complicated ;-). I am also going to use it for the legs of a pair of socks. Will add a “Sweet Tomato Heel” and a stockinette foot. Thank you for sharing. Show off your project! Add your photo to the It's a Stitch Up Flickr group and tag it with 'iphonecosy'.